After around more than an hour looking around and taking pictures at Wat Arun we moved on to our next destination which is Wat Po. To get there from Wat Arun we rode a ferry that cost us 10 Baht each from what I can remember and crossed the Chao Phraya River. Since there were so many tourists which I think is the everyday case there, the ferry leaves every 10 minutes. At the other side of the river bank you will pass through an alley and then walk a little few minutes to get to the entrance of Wat Po. Wat Phra Chetuphon Vimolmangklararm Rajwaramahaviharn or Wat Photharam or popularly known as Wat Po/Wat Pho and/or the Temple of Reclining Buddha is another Buddhist temple complex in the Phra Nakhon District, Bangkok, Thailand. It is on Rattanakosin Island, directly south of the Grand Palace. The temple is first on the list of six temples in Thailand classed as the highest grade of the first-class royal temples.It is associated with King Rama I who rebuilt the temple complex on an earlier temple site, and became his main temple where some of his ashes are enshrined. The temple was later expanded and extensively renovated by Rama III. The temple complex houses the largest collection of Buddha images in Thailand, including a 46 meter long reclining Buddha. The temple is considered the earliest center for public education in Thailand, and the marble illustrations and inscriptions placed in the temple for public instructions has been recognized by UNESCO in its Memory of the World Programme. It houses a school of Thai medicine, and is also known as the birthplace of traditional Thai massage which is still taught and practiced at the temple. This temple is one of the grandest temples I've seen. There was a nook there where there where people can pray to Buddha statues and the Buddha statues are encrusted in gold. You can even see the gold almost detaching from the statues, like you can really pick them out, but you can't of course LOL. Before you enter the temple you will be given a bag where you would put your footwear in; this is because this place is sacred and you have to be barefoot. Proper clothing is also being imposed just like in any other Buddha temples. The walls of the temples is something to marvel at as well. 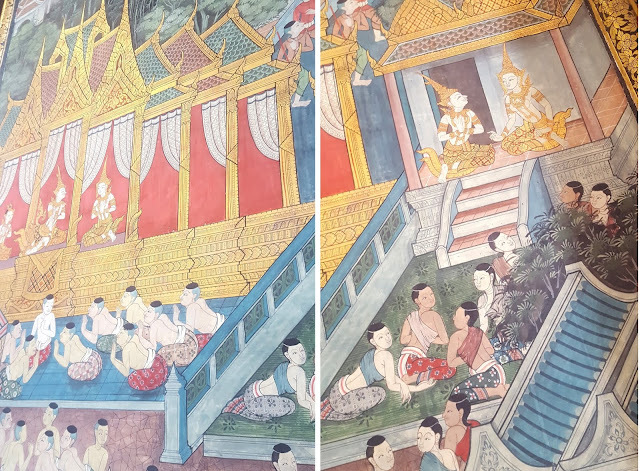 The walls of the hall that houses the Reclining Buddha have intricately detailed murals that will require a book or guide to decipher, but the exquisite murals are so detailed and intricate that even if you don’t understand all the imagery you can still appreciate the artwork. I don't know if the rumors are true that the Giant Reclining Buddha is coated in pure gold. 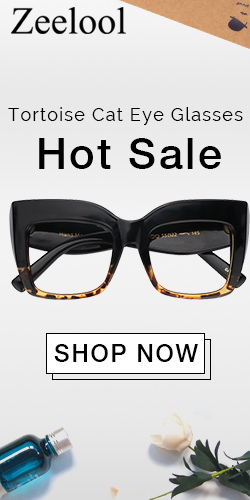 If that's the case well then it would be hard for people to steal it hahaha! Just kidding! The chapel and the reclining Buddha. 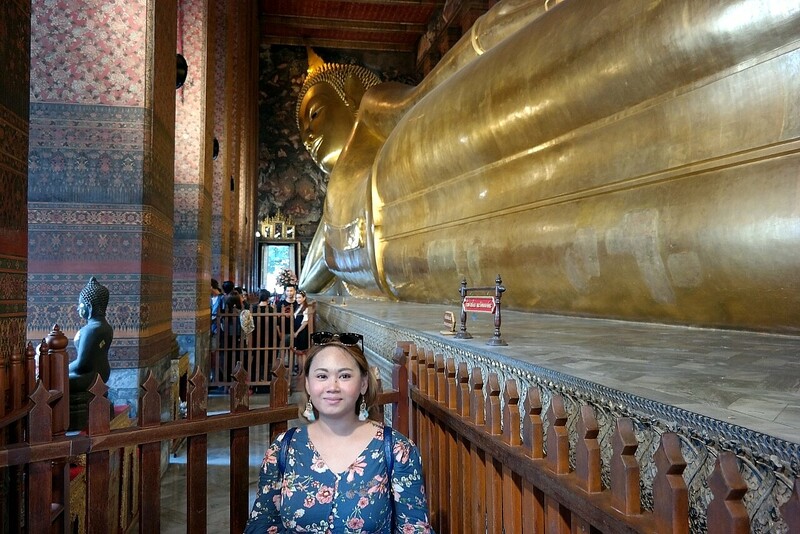 The image of the reclining Buddha represents the entry of Buddha into Nirvana and the end of all reincarnations. The posture of the image is referred to as sihasaiyas, the posture of a sleeping or reclining lion. The right arm of the Buddha supports the head with tight curls, which rests on two box-pillows richly encrusted with glass mosaics. I was so amazed by how intricate and detailed the glass mosaic on the pillow of the Buddha that if I had to be honest, this was caught my eyes more than the large Buddha itself.